Ananka's Diary: Kiki Strike is the Latest Pick for Al Roker's Book Club! 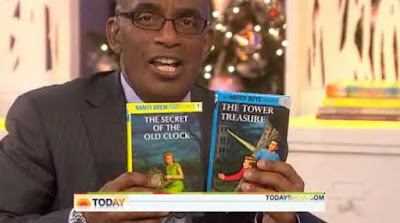 Kiki Strike is the Latest Pick for Al Roker's Book Club! It was just announced. Kiki Strike is the next selection on Al's Book Club for Kids. Which means yours truly will be on the Today show in May. Which means I get to meet Al Roker. Oh the joy! Oh the happiness! I'll keep you all up to date! CONGRATULATIONS!!!!!!!!!!! Oh, my goodness. So pleased for you! Congrats! What date in May? Karen: Not sure yet, but I'll post it soon! Yaaaaaay~ Round of applause for Kirsten!!! Good luck on your televised appearance--gods know I couldn't do anything like that, not with my stage fright and conversational awkwardness. By the way, did you get my email? I sent you...I think 6-8 links about the tips yesterday, and I just want to make sure Gmail isn't going screwy on me again. Poison Pen: Now I know your real identity! Mwahahaha. Yes, I got them, and I meant to send you a note saying THANK YOU SO MUCH! They're awesome. But my manners aren't what they used to be. Alas, I've never watched the Today show, and I don't even know when it's on . . . but I shall look this up, never fear!! OH MY SQUEEEE!!! X3 CONGRATS!!! Nice to meet all of you. I have read the blog for a while but this is my first comment. xD Glad Gmail decided to send them--I've been having dropped emails all the time lately. Extremely aggravating. And whose comment did you delete? Sorry, I am blunt. And curious. OOOOOOHHHHHH!!! this is great! people are finally starting to discover your genius-ness!!!!! pretty soon, kiki strike will become the next twilight! yessssss! i, like the golden eagle, dont really watch the today show much (except when michael buble is performing ;D) but i will tivo it when you're on! SUPER COOL! That is AWESOME!!!!!!!! I have spent so much time extolling the virtues of Kiki Strike to everyone I know. Finally you and Kiki will get the recognition you deserve! I'm SO gonna record that, but I'm hoping it doesn't become big. Then all these "fake" fans will get into the hype,and it won't be the same anymore if you know what I mean. I'll gladly settle for How To Train Your Dragon publicity. No Worries, so then the Irregulars will be able to roam NYC without being chased by a paparazzi. That would ruin the secretey of the Shadow City. AWESOME!! I HAVE to watch!! Are Ananka going to be the I- person in the third Kiki Strike book, or will it be Betty? Oda: Ananka tells the story, but Betty plays a bigger role than usual. that is sooo cool Kirsten!!!! I'm doing a book review for Kiki Stirke on our televised morning announcements. P.P.S I'm enjoying imagining your faces right now. P.S. Has anyone ever tried fried leaches? Are they any good? thats friken awesome!!!!!! congrats!!!!!! u hav 2 tell us when ur on so we can watch u!!!! Wow! What date? What time? What channel? Who is this guy anyway? I don't watch much TV--we disconnected it a year and a half ago because we hadn't turned it on since the previous New Year, although this January my brother and dad put together a reciever out of coat hangers and stuff, so we could if we wanted to. But I'll make my grandpa record it. Congrats! YEAH!!!!!!!!!!!!!!!! who the heck is he? Oh well!! I love Nancy Drew books, so he's my friend. plus he likes your books.Now his my bestest buddY!!! Dont forget to reread the tips found in your books about television apperarences!! :) By the way, I like fried leeches. Excellent with tartar sauce. Eek! Congrats! That is beyond amazing.